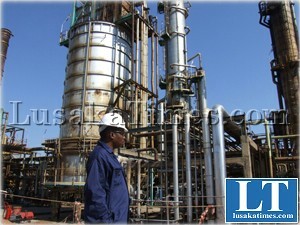 INDENI Oil Refinery has procured new crude oil free of impurities under the October consignment. Company’s Managing Director Maybin Noole said when he addressed journalists in Ndola yesterday that Indeni was operating under difficult conditions regarding the current processing of the crude oil which was contaminated. Mr Noole said the company would continue to operate to process the contaminated crude oil for a month and half before normal operations resumed. He said the already purchased crude oil for the October consignment was free of impurities. “We have purchased the crude oil for the October consignment, the crude oil is free of any impurities, right now we have continued to operate but under difficult situations. It will take us a month and a half to get back to normal operations,” he said. Mr Noole said the company had put measures in place to mitigate the challenges as there was a strong chemical that was being used to flush out the contaminated crude oil. He said the suppliers took responsibility adding that they would send engineers to the plant and do an assessment on the impact caused by the contaminated crude oil. “The suppliers were met and they took responsibility, soon they should be sending engineers to come and do an assessment on the impact of the contaminated crude oil at the plant,” he said. Earlier this month Mines, Energy and Water Development minister Christopher Yaluma said the contaminated crude oil was being refined at Indeni Petroleum Refinery. Mr Yaluma said Government procured 115,000 metric tonnes of crude oil from Oman which later turned out to be unsuitable for Indeni Petroleum Refinery. He said necessary measures were taken to protect both the refinery and cars and ensure that the oil was adequately processed. Meanwhile, the K1.6 million Indeni Site Clinic in Ndola which would help Indeni Oil Refinery employee’s access quality medical services has been commissioned. Copperbelt acting Provincial Medical Officer (PMO) Kennedy Chibwe said Government was encouraged every time the corporate world came on board to compliment the efforts in the provision of health care services. Dr Chibwe said Government had rolled out its blue print which included social services and poverty eradication through the provision of infrastructure that offered holistic and comprehensive services in communities. Dr Chibwe said the clinic would also provide male circumcision, laboratory investigations, skin, eye conditions and HIV/AIDS services to the employees. Mr Noole said it was management’s vision to ensure employees were offered medical services within their environment. Mr Noole said with the facility, the company would be able to scale up male circumcision and routine HIV/AIDS tests. Manje’ who will pay for the Filthy Oil, that destabilized Zambia? Sorry I forgot, it’s Zambia we are talking about. The guy whos supposed to make heads roll is busy sipping Pina Coladas on a Namibian beach, while the Country gets [email protected] by his cronies & cadres. Meanwhile we are still waiting from the outcome of investigation by the empty tin minister Yaluma on why we imported so called contaminated crude. To whom it may concern, I write to extend a business relationship to you. The commodity is crude oil from Nigeria, our company is lisenced to lift crude oil from Nigeria to any part of the world. Please if you are interested in this business get back to me so we can get started. Other products we have include AGO, PMS, BLCO and more. I look forward to hear from you.